With Microsoft Dynamics AX 2012 new capabilities of selling and procuring products, decoupled from inventory control, have been introduced. The purpose of this post is to describe the difference between stocked and non-stocked products of type service and to provide general recommendation about this subject. Represent finished items and raw materials. Whereas the item types Item and BOM share to a very high degree the same characteristics, the item type service is different. Services are by definition consumed at the moment they are produced and can therefore not be stocked nor “owned” unlike items. The Contoso Company (consumer) has a fleet of company cars. Once a year, the company car must undergo service inspection at a local car shop (producer). The employee will take the company car and “purchase” (consumes) the service at the car shop. The example illustrates the normal practice for service items. A business has certain services (items of type service) in their inventory, which they would like to, in the above scenario, purchase. The financial value of the service would be posted directly to expense accounts rather than inventory accounts. In order to support the scenario in Microsoft Dynamics AX 2009 the reference data for such a service item would have to be defined specially for these items. 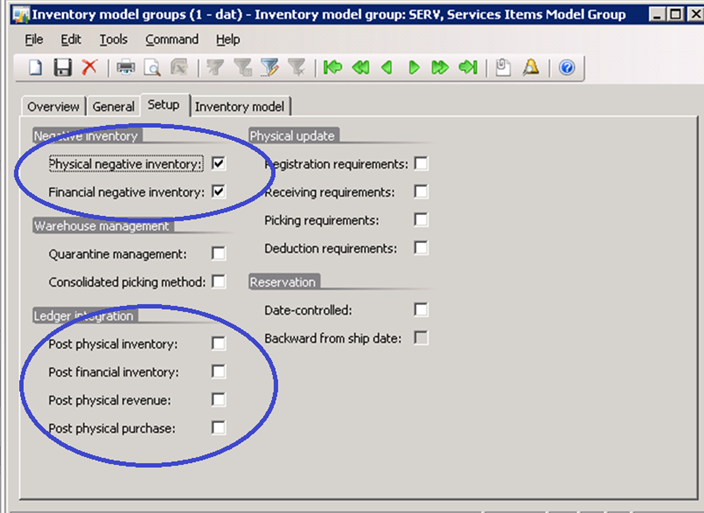 In the inventory model group, negative physical and financial inventory must be allowed for service items. Furthermore, all ledger integration options, particularly the Post financial inventory must be left blank. This will ensure that, in the example of purchasing the car service, an expense account will be used for receipt transactions. From an inventory costing perspective, the system does expect service item transactions to be adjusted. Therefore the service items transactions will be excluded during the inventory recalculation process. During the inventory closing run, the service items will be settled according to the special “service item settlement” principle, which will close service item transactions without making any adjustments, therefore will be no additional posting created. If for some reason whatsoever a service item was to be promoted to become a standard item to be purchased, the system offered the option to change the item type from service to item. This change would have a series of ripple effects, since the core definition of what functions was allowed performed with the previous service item has been changed. In Microsoft Dynamics AX 2009 order management and inventory control management were tightly coupled. This resulted in alternate solutions when trying to decouple them. In the case of procurement, Microsoft Dynamics AX 2009 introduced the purchase requisition function with its concept of non-catalog. The non-catalog concept required a dummy item of type service. This catalog item would be the only item that could be expensed directly without effecting inventory or cost accounting. To be able to support non-stocked trade for the sales side, you would instead of defining dummy service items, use the free text invoice function next to the sales order function. Microsoft Dynamics AX 2012 introduces the concept of shared products. Core product definitions containing key product attributes are defined and controlled without an organizational context. A new product process allows you to release the core product definitions to all or parts of an organization, and finalization of the product data setup is done at the individual organizational level. The item type in Microsoft Dynamics AX 2009 has been promoted into the product type in Microsoft Dynamics AX 2012. With the new concept the core product types have been revised and so some extend altered. See the table below for reference. Defining products of type service in Microsoft Dynamics AX 2012 is fairly simple. Apart from selecting the correct product type, one essential component to remember is to associate the released product in a legal entity with an item model group, where the policy Stocked product is left blank. This policy is new, and it ensures that products of type service will be expensed and not stocked in inventory. As the above matrix illustrates, if a product of type service is to be used both as a standard product offering and included in a BOM cost calculation (for a subcontracting scenario for example), it will require two unique product IDs. For a service item to support subcontracting and be included in master planning, the service item has to be setup as stocked. 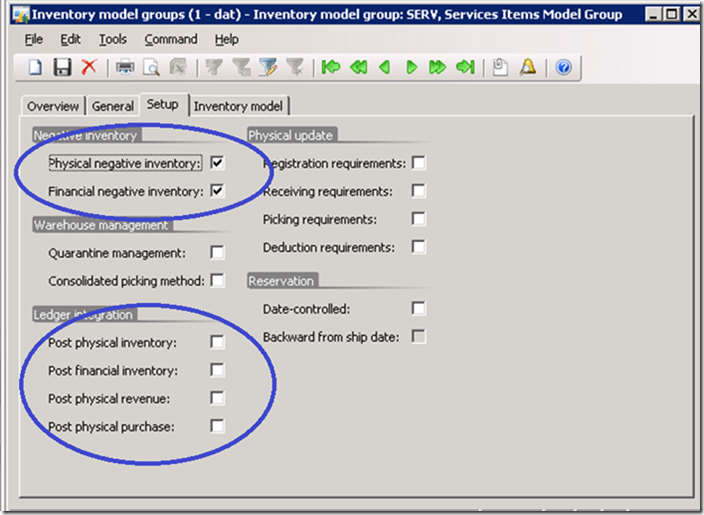 Regardless of the policy setting in the associated item model group for a product of type service, the inventory storage dimension group will still have to be specified on the product setup. However, only storage dimension site is mandatory for a source document line for a non-stocked service. Notice: during upgrade from Microsoft Dynamics AX 2009 or earlier to Microsoft Dynamics AX 2012, all items defined with item type = service, will be upgraded to products of product type = service. The associated item model group for the released product of type service will have its Stocked product value, by default, set to true. 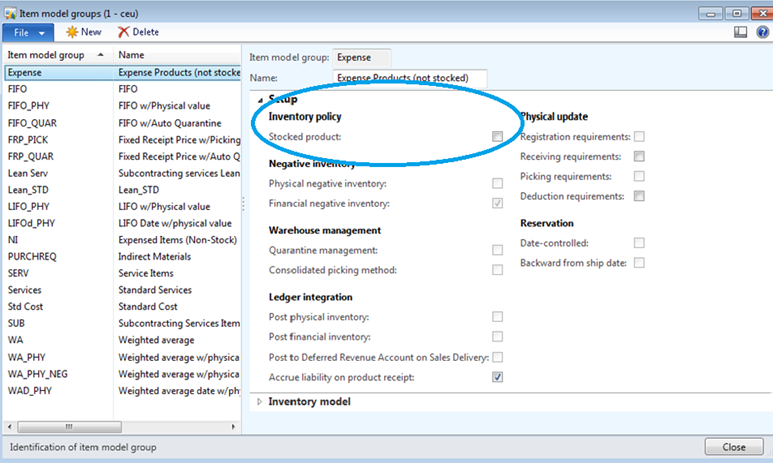 Looking at the service item example from in the beginning of this document, the most noticeable change in Microsoft Dynamics AX 2012 is the ability to decouple order management and inventory control management. 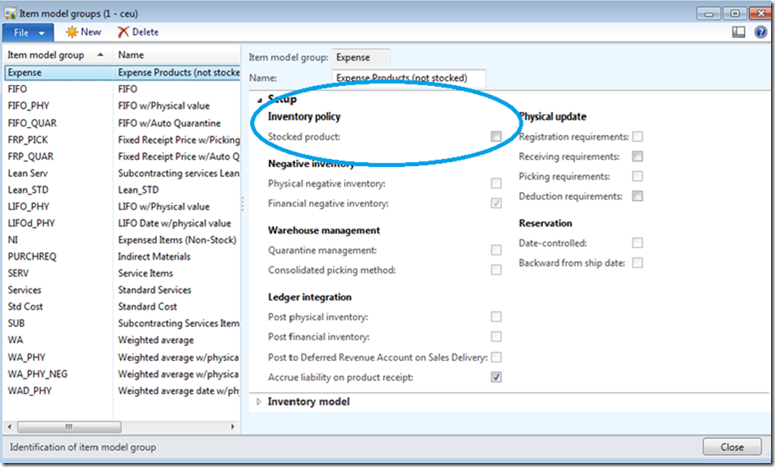 Although products of type service can either be not stocked or stocked (in subcontracting scenarios), the purchase requisition in Microsoft Dynamics AX 2012 no longer requires dummy service items to include in catalogs, because of the new stocked product policy. The policy now supports to be able to both procure and sell all kinds of products in a consolidated manner, which means on a single order. Please note that system supports the conversion between stocked and non-stocked services. With Microsoft Dynamics AX 2012 new capabilities of selling and procuring, decoupled from inventory control, have been introduced. This non-stocked trade is being supported by a new policy called stocked product on the item model group. By applying the policy, products of type service can be expensed directly without any use of inventory control processes. All the information about AX 2012 posted here is a pre-release. Any feature is a subject to be changed before the release without notice. This disclaimer is applicable to all posts about AX 2012 in this blog.